On this day, December 17, in 1938 at 3:00 in the afternoon Mayor Edward Kelly, accompanied by Harold L. Ickes, Public Works administrator for the federal government, and leaders of civic organizations from across the city, left city hall and paraded up La Salle Street to Chicago Avenue, at which point they headed east to a speakers’ rostrum set up on State Street. 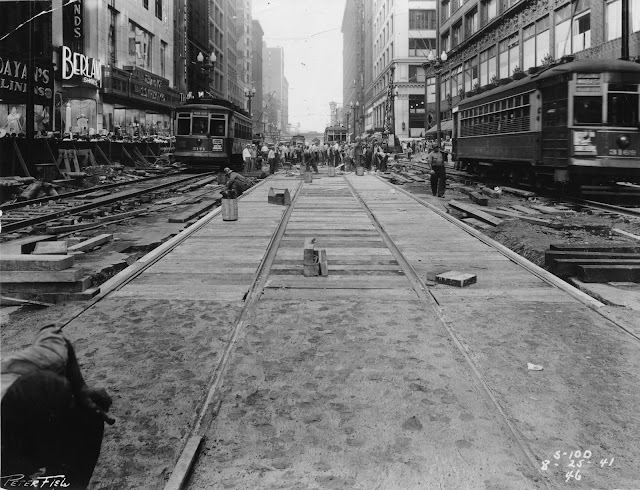 Once assembled just south of Chicago Avenue, Alderman James R. Quinn, chairman of the city council’s local transportation committee, introduced the mayor and Mr. Ickes and the ceremonies that marked the beginning of construction on the State Street subway kicked off. Most work was done using the "deep bore" method with minimal disruption above ground. The vision for a downtown subway had been shared as early as 1902 when Bion J. Arnold, who helped design New York City’s subway system and who was known as the “father of the third rail,” recommended a coherent system of underground railways for Chicago. The Chicago Plan of 1909, which began a remarkable two decades of grand municipal projects within the city, recommended burying the streetcar lines in its chapter on transportation. 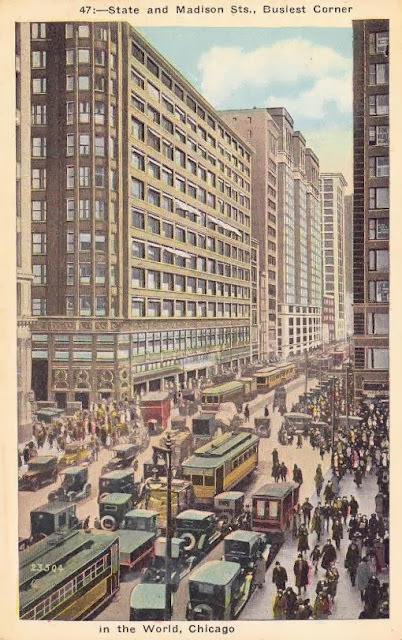 “There should be an underground street car system [along the side and south of the Twelfth Street passenger system; thence over to the Alley L as at present, around by Lake Street and across to the West Side passenger station],” Daniel Burnham and Edward H. Bennett wrote in the 1909 plan. 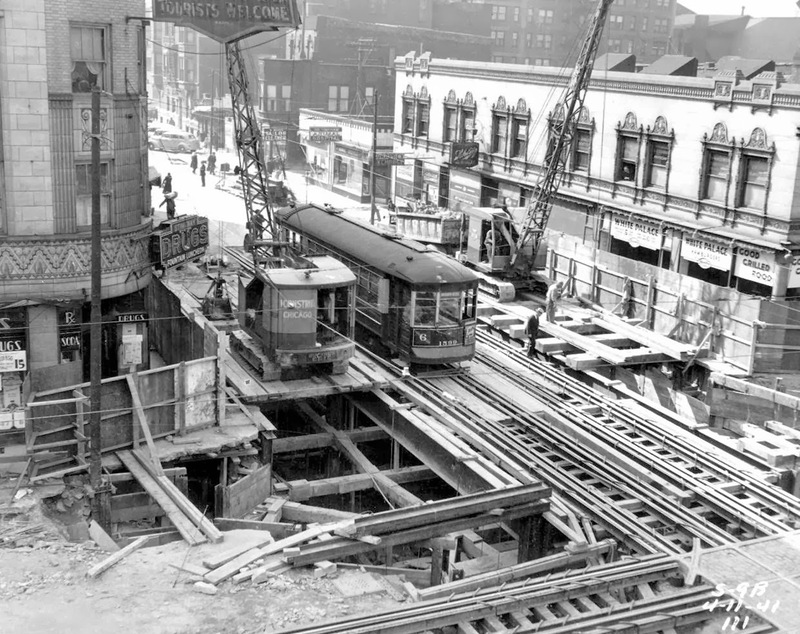 From 1907 until the State Street subway was begun in 1938, money accumulated in a special traction fund, into which the city’s privately managed surfaced lines paid. [Borzo, Greg. The Chicago “L”] In 1913 Mayor Carter Harrison put forth a plan to bury the surface lines in the Loop in a proposal that would have cost well over a million dollars, but nothing came of the idea. 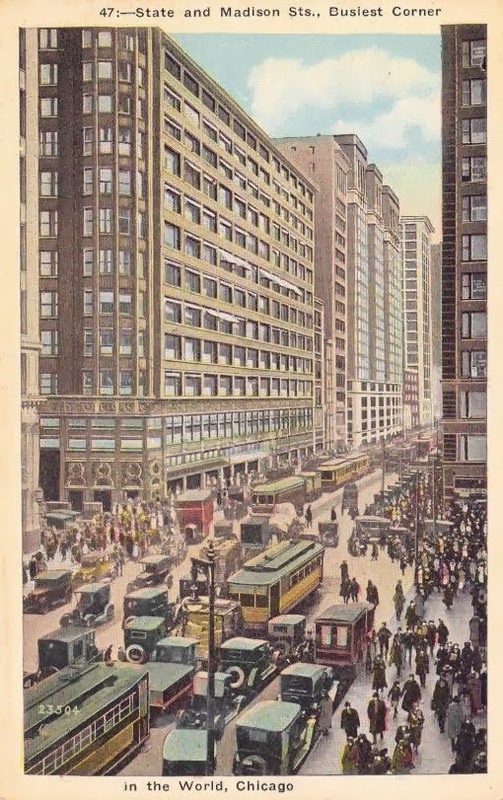 In the interim, things just kept getting worse as State Street and its surrounding commercial district grew into an increasingly alarming bedlam of pedestrians, horse drawn express wagons, automobiles, and trolley cars.
. . . the noises of surface and elevated road cars is excruciating. It is not desired that this evil can be largely mitigated. These conditions actually cause misery to a large majority of people who are subject to the constant strain, and in addition they undoubtedly cause a heavy aggregate loss of money to the business community. For the sake of the state, the citizen should be at his best, and is the business of the state to maintain conditions conducive to his bodily welfare. Noises, ugly sights, ill smells, as well as dirty streets and workshops or offices, tend to lower average efficiency. It does not pay the state to allow them to continue. Moreover, citizens have pride in and loyalty to a city that is quiet, clean and generally beautiful. It is not believed that ‘business’ demands that our present annoying conditions be continued. In a state of good order all business must be done better and more profitably. With things as they should be, every business man in Chicago would make more money than he does now. Things dragged on for decades, but once construction began, things moved quickly. 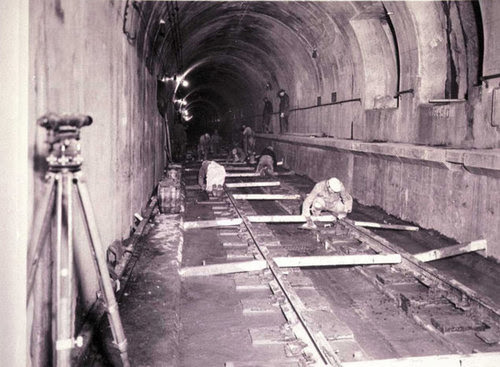 The project was exempted from the prohibition against construction during World War II because it was determined that the new subway, carrying soldiers and sailors from place to place within the largest railroad center in the world, was integral to the war effort. Less than five years after the ceremony in December of 1938 Mayor Kelly cut a ceremonial red, white and blue ribbon strung across the northbound track of the new subway at 10:47 a.m., and the new line officially opened for revenue service after midnight on October 17, 1943.